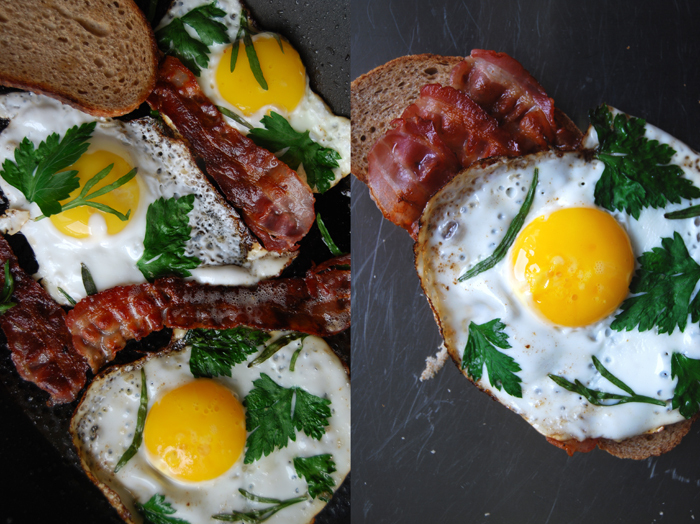 One morning we decided to “decorate” our fried eggs with fresh herbs and it became a morning classic in our kitchen. It looks really pretty and tastes even better. The variations are endless and change all the time depending on the herbs growing in our terracotta pots, and there are plenty at the moment! Usually the small plants don’t survive the cold winter, the roots aren’t really as protected as they should be. I tried to keep the herbs inside on my kitchen window sill during the cold season but they tend to suffer from bugs and mildew, so I gave up. I wish them the best of luck, protect them with some leaves and hope for the best. To my surprise, a fragile, skinny tarragon plant, an offshoot which I dug out of my mother’s herb garden managed to bear the cold and frost and it’s shining again in its recaptured bloom and beauty. I love its strong aroma which reminds me a bit of aniseed. 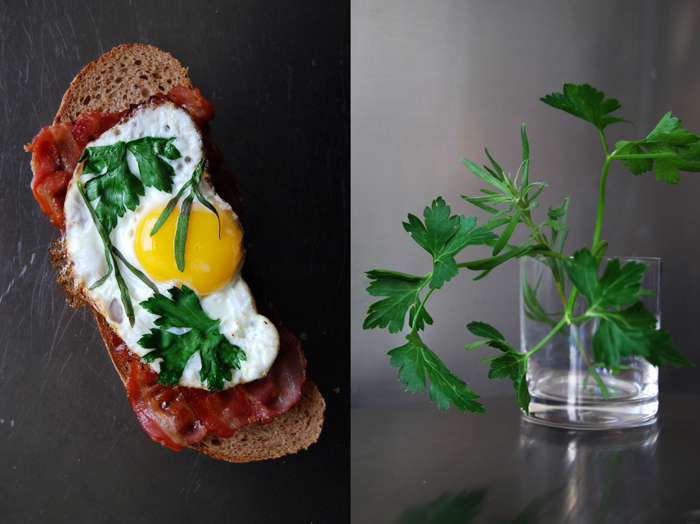 For my fried eggs, I picked a few of the tarragon’s long leaves, about 6 slim ones for each egg, and some crunchy parsley, the Italian one with big flat leaves. The combination works well, I just went easy on the parsley, 2-3 leaves per egg were enough as it can easily be too overpowering. 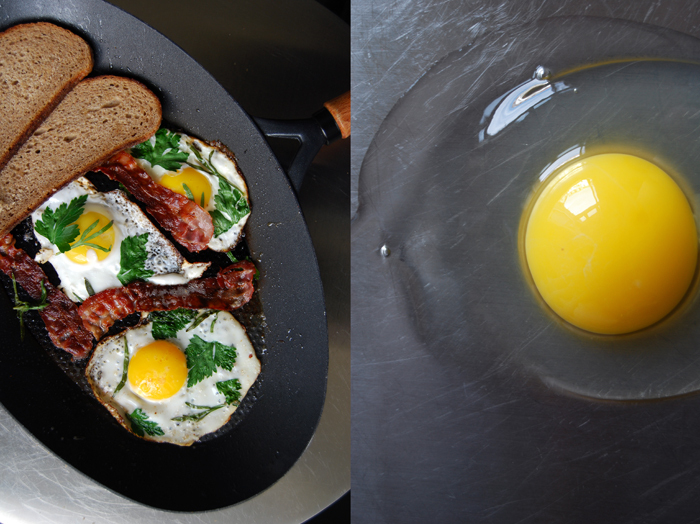 I fried the eggs in a little butter on medium heat in a non-stick pan, put the herbs gently on top of the liquid egg whites and yolks and covered the pan with a big lid until the whites turned solid. 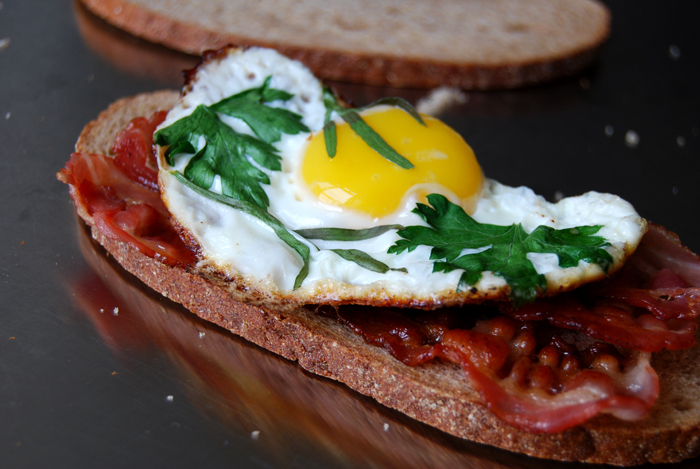 I kept the egg yolk soft as I wanted it to soak into the hearty bread when I cut it open. 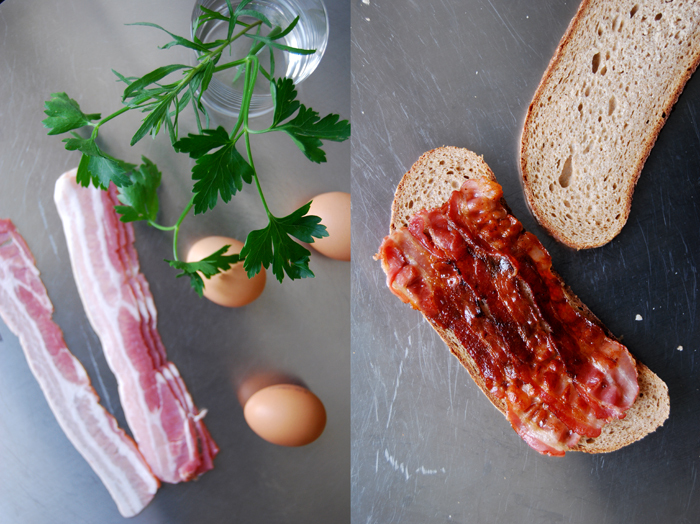 To finish off my sandwich, I fried 3 slices of bacon golden brown and crisp and put a few slices of my dark spelt bread into the pan as well. When you roast the bread in the fatty juices, just in the end for a minute or two, it becomes a bit crunchy and is infused with the meaty aroma. I didn’t add any salt, just crushed black pepper, thanks to the strong bacon!